We've only had our iPad* for a few months, and I already can't imagine life without it. Which is probably a real testament to this device, because despite having a blog and now an iPad, I'm really not very techie. If you saw my cell phone, you would think we had all traveled back in time to at least 2001. We have found the iPad to be particularly helpful while traveling--it is a source of entertainment, our GPS, and a "let's look that up" device while on the road. Someday I'll do a post on favorite iPad apps while traveling (I'm still in research mode on that), but until then, I'll give you a sneak peak at how we put it to use entertaining the arrow during last week's flight. 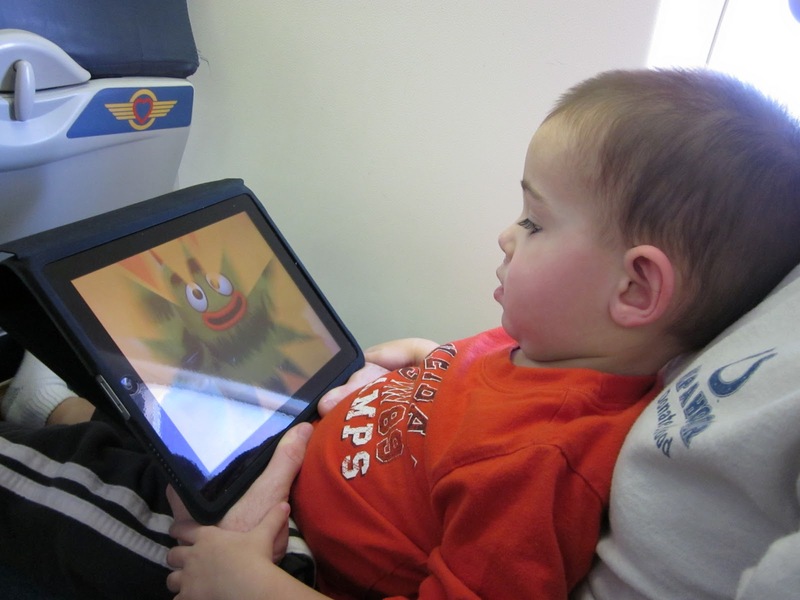 While he's usually pretty happy to look at books or color while flying, our return trip fell during his usual naptime. It was pretty clear that he wasn't going to curl up on our lap and doze off on this trip, so it was nice to have something with which he could still relax and settle down. My husband and I even got to indulge in some adult conversation while the arrow was singing along with his buddies from Yo Gabba Gabba. I call that a win, win for everyone. This post is a part of You Capture at I Should Be Folding Laundry. This week's theme is technology. I'm also linking up to Things I Love Thursday at The Diaper Diaries. At first I thought ipads were silly, but I'm finding myself wanting one more and more. One could be handy. So glad you are enjoying the ipad, I am ecstatic that the ipad 2 is about to be available since it's been on my want list. I often say that I have no idea how we used to travel without our iPhones! I love my iPad and take it with us everywhere we go. It is so great for traveling with the kids. I work for DISH Network and have the TV Everywhere app on my iPad. The kids can watch live TV from anywhere we are at. They have access to all our subscription channels and our DVR. They always want to watch their favorite shows while we are on the road. It is like having the TV with us. It is such a life saver. Same here. The GPS and the internet connection makes the iPad a necessity for us when traveling. The camera in the iPad is also a great addition because we can leave our old digital camera at home.